Create a Style for it and set it to the CalendarStyle property of the RadDateTimePicker. 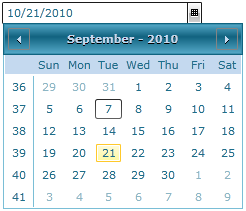 Modify the default resources for the RadCalendar, that are generated together with the RadDateTimePicker's Style. To learn how to generate the default Style for the RadDateTimePicker read here. To learn how to modify the layout of the clock, look here. 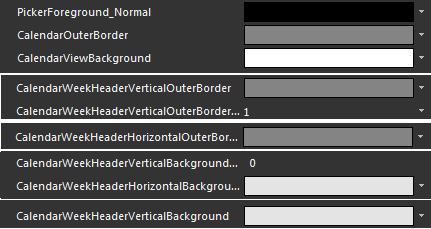 In order to see these resources you have to first generate the default style for the RadDateTimePicker control. To learn how read this topic. PickerForeground_Normal - is the foreground brush used in the RadDateTimePicker. 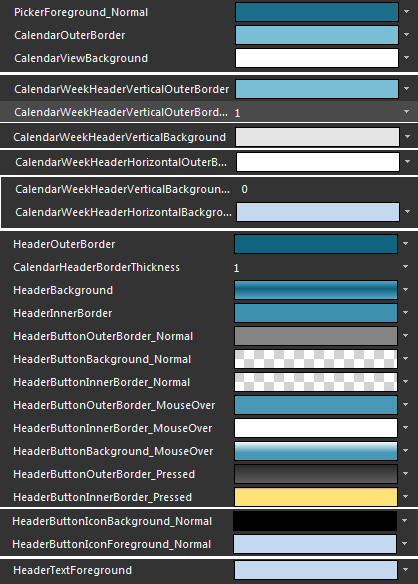 CalendarOuterBorder - is the calendar's content outer border brush which appears around the calendar view. CalendarViewBackground - is the calendar view's background brush. CalendarWeekHeaderVerticalOuterBorder - is the outer border brush used for the vertical line separating the week numbers from the dates in the calendar's month view. 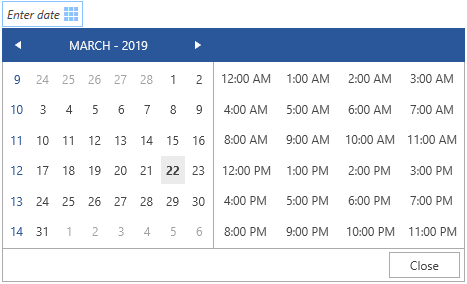 CalendarWeekHeaderHorizontalOuterBorder - is the outer border brush used for the horizontal line separating the days' names from the dates in the calendar's month view. CalendarWeekHeaderHorizontalBackground - is the background brush used in the calendar's month view, appearing behind the days of the week's names. CalendarWeekHeaderVerticalBackground - is the background brush used in the calendar's month view, appearing behind the days of the week's names. CalendarButtonButtonChromeMargin - is of type Thickness and allows you to change the calendar view element's margin. RadCalendarDefaultStyleKey - defines the calendar's default style. HeaderTextBackground - is the foreground brush applied to the RadDateTimePicker content's header. MoveLeftButtonStyle - is the style applied to the header's left button. CalendarHeaderButton - is the style applied to the header's main button. Normal - is the normal state of the corresponding element. MouseOver - is active when the mouse is over the corresponding visual element. Pressed - is active when you press the corresponding visual element. ButtonChrome - a ButtonChrome which default style is HeaderButtonChrome style. BackgroundIcon - the background arrow pointing left or right. ForegroundIcon - the foreground arrow pointing left or right. HeaderButtonOuterBorder - is the element's outer border when it is in the corresponding state (from those described above). 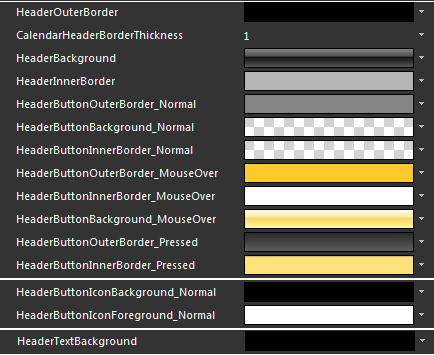 HeaderButtonInnerBorder- is the element's inner border when it is in the corresponding state. HeaderButtonBackground - is the element's background when it is in the corresponding state. HeaderButtonIcon - defines the left and right icon's appearance through in the corresponding state (from those described above) including the Disabled state.